Over January 11th, 2016, musician Aoi Eir uploaded a short lyric video for her latest single Accentier, which will serve as the title theme to the upcoming Digimon World -next 0rder-. The music video does not feature Aoi herself, but instead a sequence of computer-generated images synched to the first minute of Accentier. A translation of the lyrics is provided below; the video is region blocked, and may not work for viewers from all countries without the use of a VPN. 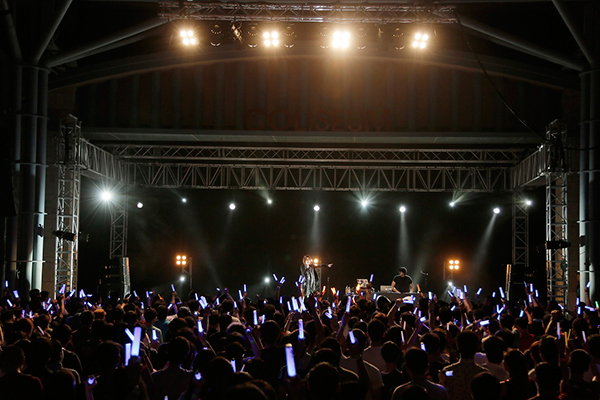 Aoi Eir makes an appearance in Singapore on the 11th, to a crowd of over 800 fans. Original image by musicman.net. Aoi is a fan of the Digimon World series, having played the original game with her younger brother when she was a child. Like -next 0rder- character designer Taiki, she has a personal investment in the series. She will also be appearing in an upcoming Digimon World reunion livestream on the 21st, as a representative of the game's userbase. It's because you're unable to stand. Such things I don't understand. Everyone wishes to see it. And even one year later, they're not the goal. What they take out is a small gift.